Product Condition: The Elsin Sweater Coat - Women's is in Good condition. This sweater is in good condition with original tags attached. The left front pocket is coming unstitched. There are no stains or piling to this sweater. 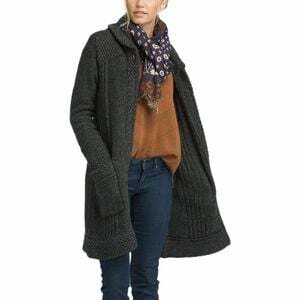 When you're wearing the Prana Women's Elsin Sweater Coat you wish the cold weather would never end. Dress it up with your favorite pair of skinny jeans and booties to go to your friend's art show, or throw it over a pair of leggings for an afternoon studying in the library. The mid-thigh length and high shawl collar add extra protection from the chill, while the popcorn detailing on the hem, shoulders, pockets, and sleeves give the coat an elevated aesthetic. After all, functional sophistication is your style.